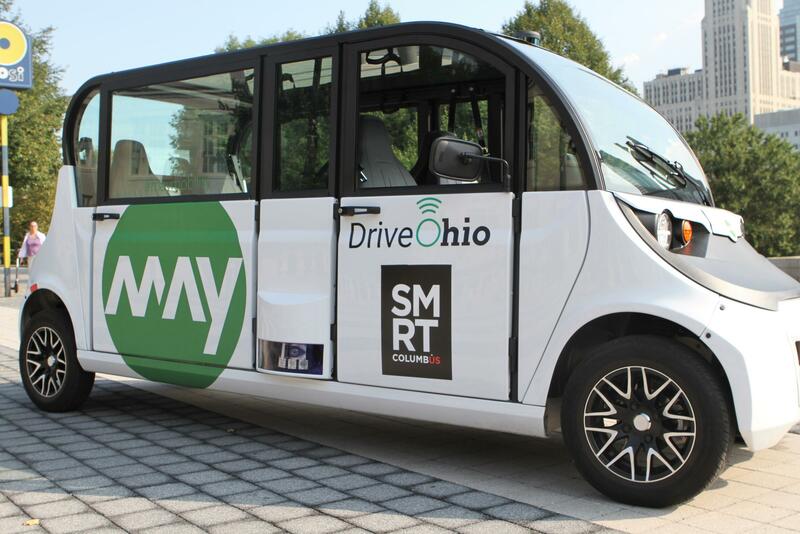 These driverless shuttles, which can hold five people and a "fleet attendant," will circle Scioto Mile beginning in December. The interior reveals six seats, four in the back that face each other and two in the front: one for a passenger, and one for a fleet attendant who will be able to assume control of the vehicle. It's a shuttle that key players hope to see more of throughout the state. 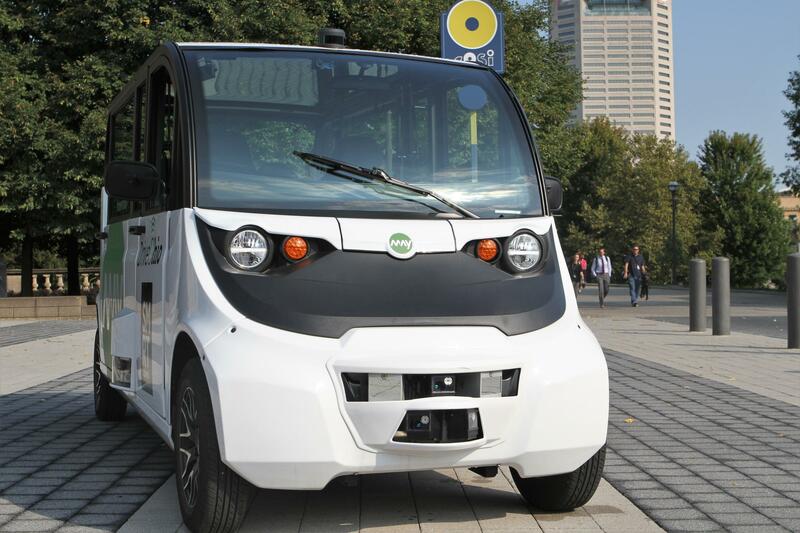 Three battery-powered self-driving shuttles are scheduled to operate daily from 6 a.m. to 10 p.m. starting in December, driving around the Scioto Mile. The 15 mile-per-hour self-driving shuttles will connect COSI, the Veterans Memorial, Smart Columbus Experience Center and Bicentennial Park. That three-mile route is not currently served by COTA buses. According to Smart Columbus director Jordan Davis, the self-driving shuttle system is the first of a three-phased series of pilots to be introduced in the city. May Mobility, an Ann Arbor start-up, will supply the shuttles to Columbus. 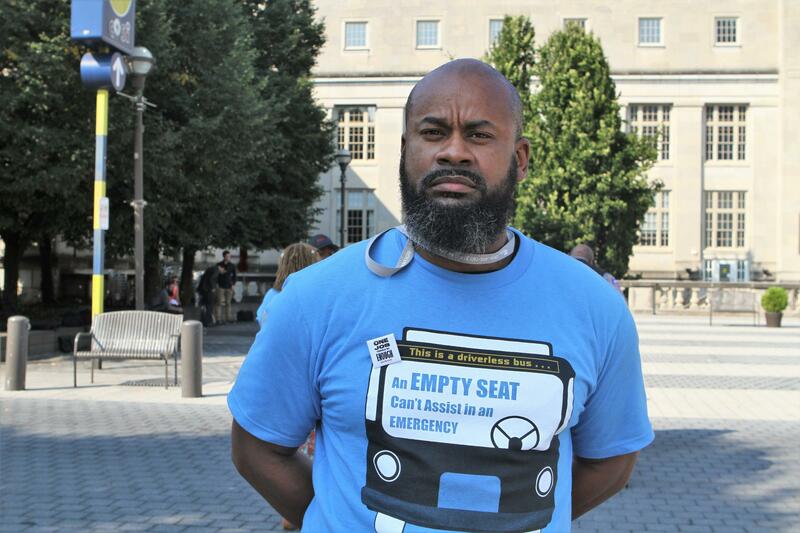 The company runs a similar shuttle service in Detroit, which just carried its 10,000th rider. CEO Edwin Olson says 21 different sensors look out onto the roads from the bus. All the sensor data returns to a computer in the middle of the vehicle that observes the environment and predicts how people will behave in the future. The shuttles won't be entirely without a human presence. A fleet attendant will sit in a front seat to help people become accustomed to the driverless technology. Smart Columbus, which is working to innovate transportation in the city, unveiled the driverless shuttles at an event Wednesday. “Their primary job is to help customers feel comfortable, especially the technology’s new, sometimes people don’t know how to interact with an autonomous car,” Olson says. But the attendant can take over the vehicle with a small controller attached with what looks like bicycle handlebars. Olson says the fleet attendant may drive the shuttle from the garage to the road before having the driverless technology take over. Engineers will test the shuttles in October, and they expect to offer public rides in December. Davis says the shuttles will provide another downtown transportation option. “I think we’re gonna find unintended benefits, that people use it from the parking lot to get to downtown, or people use it to go to the restaurant to get into Franklinton,” Davis says. Davis says there are two goals with the driverless shuttle service. “What we’re really looking to do is educate the public about self-driving technology, but also to learn as a city as other interested parties in the technology,” Davis says. The shuttle system rollout costs $550,000, according to Davis. The Columbus Partnership and DriveOhio are co-funding the effort. Smart Columbus, the city’s transit innovation project, is funded through a $40 million grant from the Department of Transportation. How Essential Is The Human Element? 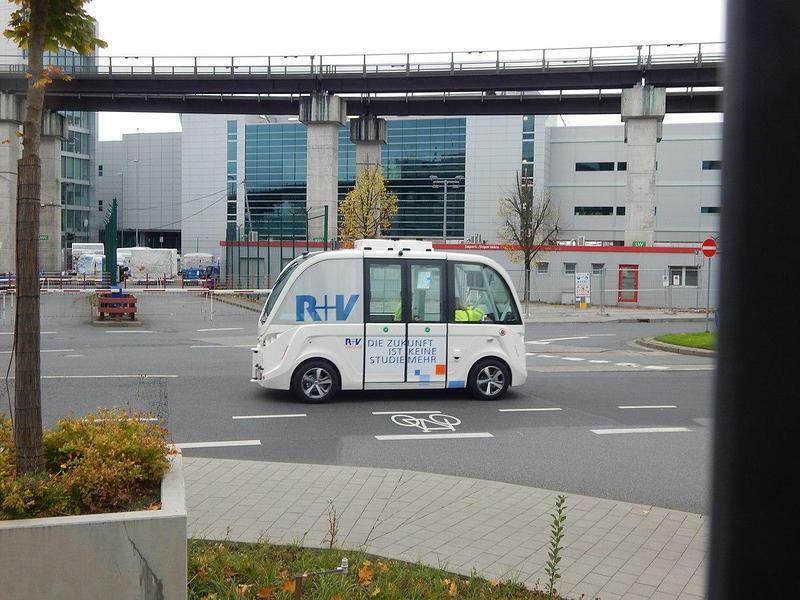 While city leaders are excited about the possibilities, Columbus transit workers look warily on the autonomous shuttles, fearing that eventually city buses will become driverless. Darryl Neal, a member of the Transport Workers Union, says driverless shuttles aren't safe - even with a fleet attendant. 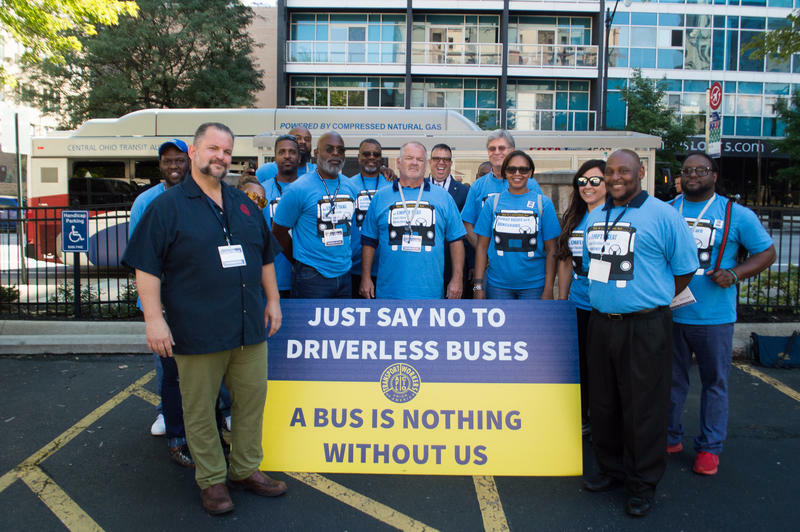 On Tuesday, the Transport Workers Union of America formed a statewide coalition with the goal of stopping driverless buses from hitting the streets. Union member Darryl Neal, who has driven a COTA bus for 10 years, says a fleet attendant is not enough. “Just a couple of months ago, I found a suspicious device on my coach at the end of the line,” Neal says. Police came to investigate and locked down the bus. Neal questions the safety of driverless vehicles without trained drivers. “I was trained to spot these things," Neal says. "An AI, artificial intelligence, cannot get out of the seat to make sure this bus is safe." Columbus wants to convince residents otherwise. Rides on the shuttle will be free for the first year. Information isn’t available yet for how much the shuttles may cost riders in the future. Smart Columbus predicts the pilot program will bring 26 new jobs to the city - including technicians, fleet managers and operators. Gov. 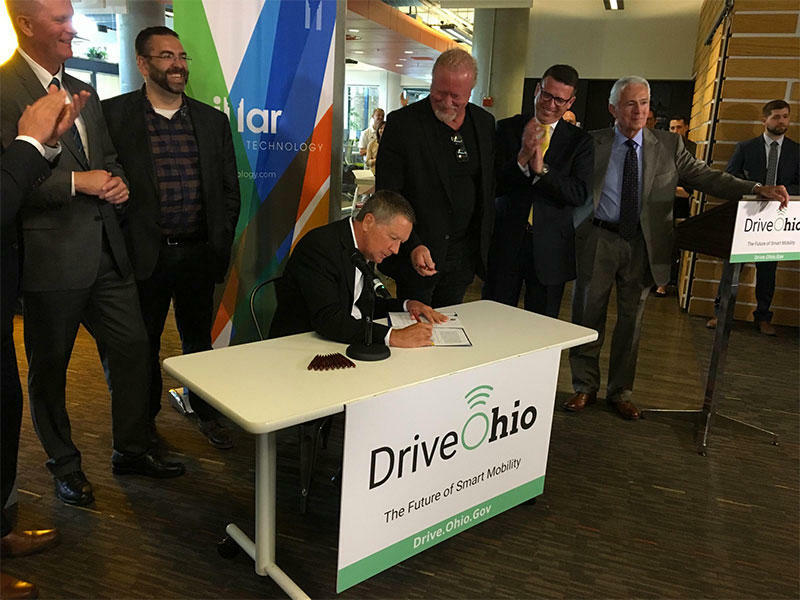 John Kasich has signed an executive order opening up any public road around the state for testing for driverless vehicles. Central Ohio may be investing heavily in driverless trucks, buses and cars, but the Columbus bus drivers’ union says autonomous buses shouldn't run without staff onboard.